As a serious RC enthusiast, I’ve driven, raced or played with just about every type of land-based RC vehicle out there. All of them are a lot of fun, but in the end they’re all pretty much the same; battery powered, motor driven and with limited run times (on a single charge or fuel fill). So when a very large rectangular box from HobbyKing showed up at the office with the BAT 1 in it, I was all over it. 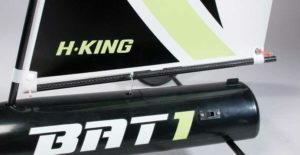 HobbyKing’s BAT 1 RC Land Yacht is a pretty interesting vehicle that only requires four “AA” batteries to drive it. Seems like a pretty weak power system until you realize that the “AA”’s don’t propel it; it relies completely on wind power! 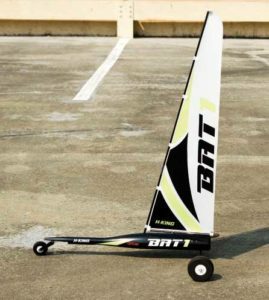 Yes, the BAT 1 is very similar to those high-speed wind vehicles you might have seen on the flat desert landscape, all powered by the wind. Now this is different – I can’t wait to give this thing a go! After wrapping my head around how the sail system works, it was time to head outside and give this wind-powered 3-wheeler some stick time. I gathered up the BAT, the transmitter and the ambitious E-Man and trekked out to the parking structure outside our building. It was a beautiful day, however there was very little wind; the one thing we needed. We gave it our best but without that wind the BAT 1 barely moved. Back to the office we went. Let me tell you that having the BAT in my office on the bench staring me in the face was like getting a new bike for Christmas only to find out it’s raining outside. It was four days before Mother Nature finally decided to cast some wind my way, so it was back outside to give the BAT another try. 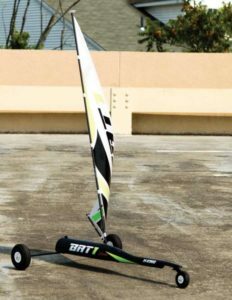 Anything RC is fun for us and when the BAT 1 rolled into the office, we were pretty excited to try it since it was something a little different. Once you get it going (that is, once there’s wind), it’s actually really fun to drive. The controls are similar to a regular RC car so if you have any experience driving, you’ll pick this up in no time. Transmitter on; switch on. Steering working; check. Boom swinging; check. After my ‘all systems go’ check, I set the BAT down and immediately it started speeding away as the wind caught the open sail. As I approached the end of the parking area, I applied brakes on the throttle to cinch the sail in but found that the BAT doesn’t actually have brakes! Cinching in the sail only limits the amount of air that it gathers; slowing down is simply a matter of it losing speed! Panicking a bit, I cranked the wheel and the BAT aggressively whipped around and almost immediately the sail swung around to the other side. Ah, now I’m getting the hang of it. No matter which way the BAT is pointed, the sail will swing to the ‘wind’ side as long as you have the throttle open. I drove the BAT around for what seemed like an eternity before Edwin graciously noted that he’d been done with pictures for about 20 minutes! Yes, the run-time on this thing is unreal; as long as your “AA”’s are fresh and there is wind, you could go all day! 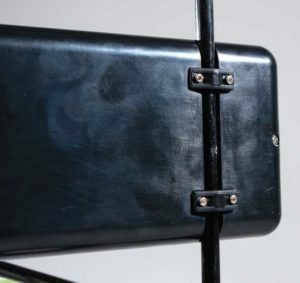 A small lid on the back of the BAT1 opens to reveal the “AA” holder and receiver. It is secured with a pretty strong magnet. The BAT 1 comes with a multi-piece chassis that, well, looks like an actual baseball bat. 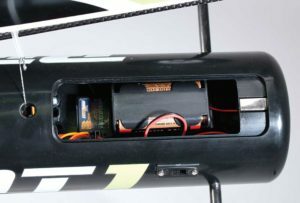 Loaded inside the big end of the BAT are all of the electronics with the “AA” holder and receiver easily accessed by a magnetic door on the rear/upper surface. If you need to reach the servos or linkages, simply remove a few screws from the bottom of the BAT and the two hullhalves separate. A carbon boom towers out of the center of BAT and is secured within the hull. The sail is then attached at different points and secured by a rubber band and a toothpick. Yes, you read that right, a toothpick. The rear axle is held in place by a pair of hoops. To mount it correctly, measure and mark the center point of the axle, sliding it in place with your mark centered to the chassis. The suspension on the BAT isn’t like any other RC vehicle. In fact, there’s really no suspension at all. Instead, it uses three foam tires to help absorb any ground irregularities you might encounter. The front features a small tire on a fixed axle that is mounted to the extended steering arm. The rear is simply a carbon rod that has a pair of larger, bearing-supported foam tires attached to it. The BAT does bounce and hop around a lot on bumpy surfaces, but I found that when I loosened the front wheel’s extended arm slightly it gave it a little play, or something resembling suspension action. This helped when hitting bumps as it didn’t bounce the BAT violently in different directions. The main power system is this enormous sail. It swings on a pair of carbon booms and is actuated by a second servo that controls the main sheet line. 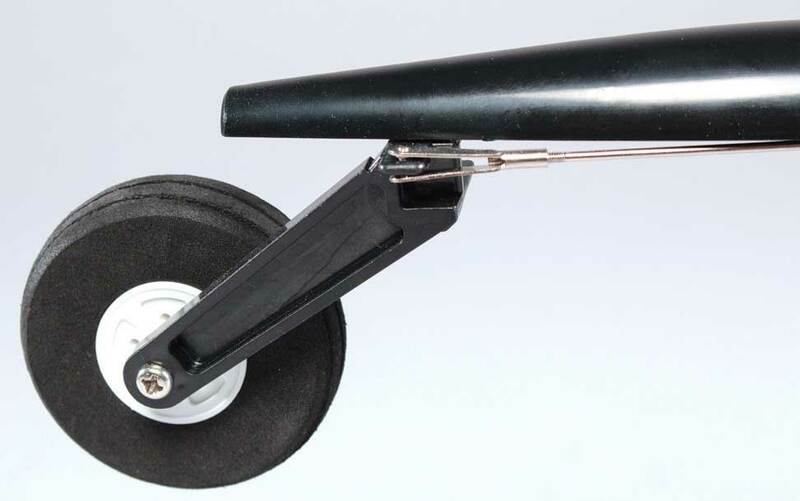 The steering servo is attached to a long rod that connects to the single front wheel with a clevis. It reacts the same way as your typical RC car; turn left, the BAT turns left. Turn right, the BAT turns right. The servo speed is good and doesn’t need a lot of torque since the BAT is so light. At high speeds (or under heavy wind), the BAT tends to push a little since there’s no weight on the front to dig in. I might add a few cubes of weight in the nose to help with steering. Since the BAT is powered by wind, it only needs the giant sail for movement. The main sheet line extends out of the hull and is attached to the sail at one end and a second servo on the other. Connecting the sheet line is a little tricky … it took me a few tries to figure out exactly how it works. 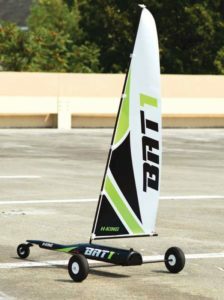 The throttle on the transmitter actuates the sail, but here’s the trick: when you pull the throttle on the transmitter (similar to accelerating in a normal RC car), it provides slack in the main sheet line and allows the sail to swing, catching air and moving the BAT forward. When you push forward on the throttle (similar to braking on a normal RC car), you are cinching in the main sheet line, or preventing it from swinging. 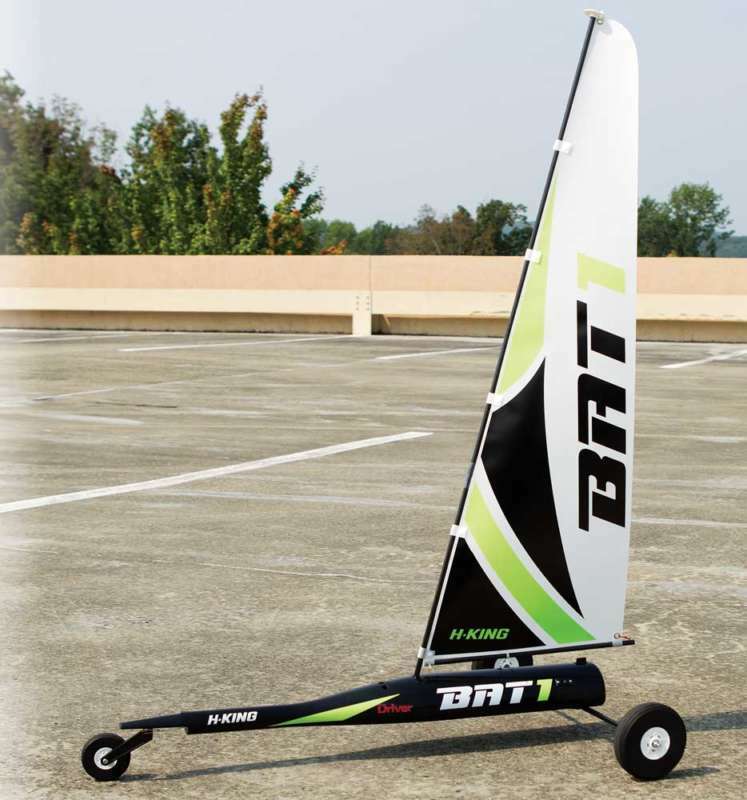 This keeps the sail inline with the BAT and limits the amount of air it can catch, effectively slowing it down. Trust me, it’s weird at first but you’ll get the hang of it. 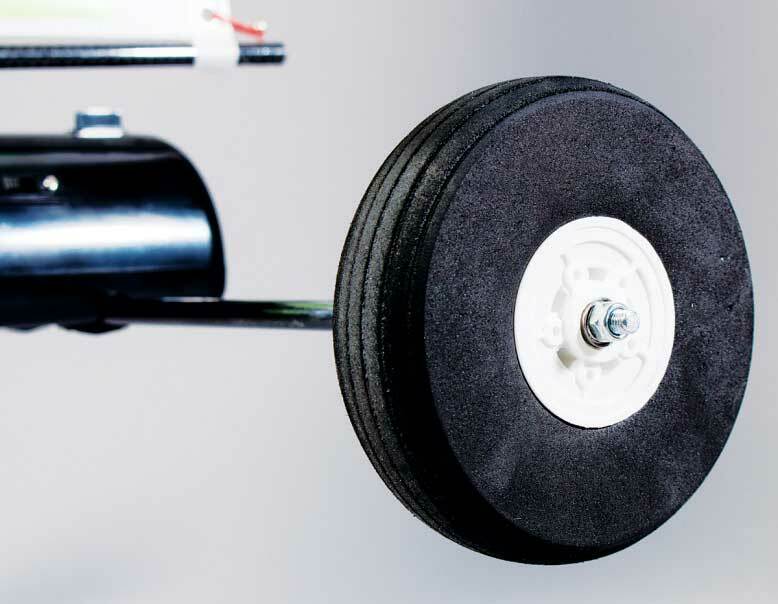 The rear foam tires are extremely light and provide a little cushion when driving over uneven surfaces. Ball bearings ensure smooth rotation. The front tire is also foam and rolls on bearings. An extended arm controls the steering by a long rod connected to the servo in the batshaped chassis. This is really a fun and different form of RC. Go out on a windy day and you could literally sail around for hours before having; the only limiting factor (other than the wind) is the charge in the “AA” batteries. I enjoyed it so much that I’m already contemplating upgrades to boost the performance; ceramic bearings, smaller/lighter electronics and even a LiPo conversion. Salt flats, here I come!